Are you or your spouse active military or wounded in action? If you answered YES, first off, thank you for your services, second off, BeachBody wants to thank the men and women in our military by offering them the fantastic opportunity of being a BeachBody coach for FREE!! 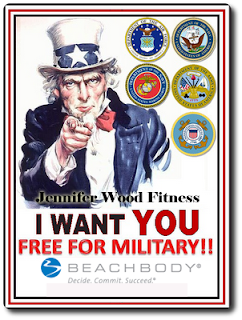 I am a military wife and also a FREE Beachbody coach! Beachbody will also pay your $16 monthly office fees AND their is no minimum purchase requirement or quotas, you can either be a discount coach, sell to your friends and family or make it a serious business and make 25% plus other bonus commissions and free leads when you find two coaches yourself. AWESOME! You will get 25% off any Beachbody product that you want! Any program, you name it, P90X, Insanity, Insanity the Asylum, TurboFire, Les Mills PUMP and so much more. Same goes for the supplement like, Shakeology, Results and Recovery formula, Energy and Endurance formula, etc! AND the same for all the gear, the pull up bar, bands, balls, you name it! Secondly, for anyone that has always wanted to own their own business. This is your CHANCE! You get the rewarding feeling of helping others along in their journey by helping them choose the right program that is for them. Make this your full-time or part-time job. Either way, you get this amazing opportunity FREE. How do I become a Free BeachBody coach? 2) At the top of page 1, indicate the branch of service and your title. Also on page 1, fill out the Applicant Info section, and sign and date the bottom. 3) Email the completed document to Team Beachbody Coach Relations at coachrelations@teambeachbody.com and include a copy of your orders stating that you’re on active duty. This is the easiest way to do it. You can edit the PDF application for free at http://www.pdfescape.com/. There is also a fax option! If you choose this option be sure to use this fax cover sheet!